This entry was posted	on Wednesday, October 24th, 2007 at 2:06 pm	and is filed under Photog. You can follow any responses to this entry through the RSS 2.0 feed. You can leave a response, or trackback from your own site. Great photo. Good lighting and colors. Don’t get too close to the fire. I’ve got ashes on my car here in Westminster, CA. Can’t smell the smoke as much as yesterday. it is a great picture..you can see the ash on the side of the truck. It’s a really sad situation but these men and women are so brave and important…and it’s especially true in times of crisis. This looks very similar to the scene we had up here in Santa Clarita. It was a horrible week. Evacuations, smoke filled lungs, ashes everywhere. Just terrible. Thanks for sharing the photos. Good picture. Something about the lighting or something makes it look surreal. Maybe it’s the smoky atmosphere. Good shots. Be careful where you are there. 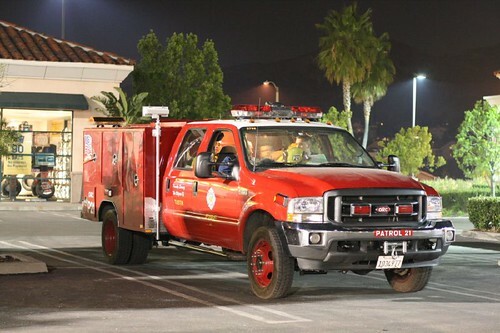 Nice photo, the fire truck looks likes old school. However, as long as it get the job done. Now that I like. Very “action shot”–not to mention very appropriate to the moment.